Wow! Have you seen what the big brands are charging for just a single HDMI cable Quite frankly it's a joke! Who wouldn't want to save some cash these days Well, here's our solution: Get a high quality, gold plated, 2M HDMI cable AND a USB cable for UNDER $30! Did you know the latest PS3 comes without and HDMI Cable Would you like to charge your controllers for your PS3? Good News! The TekNmotion Combo Cable kit is the financial bailout you've been looking for! Everybody-including gamers-wants to save a buck or two so we've pleased to introduce the HDMI and USB Combo Cable Kit. 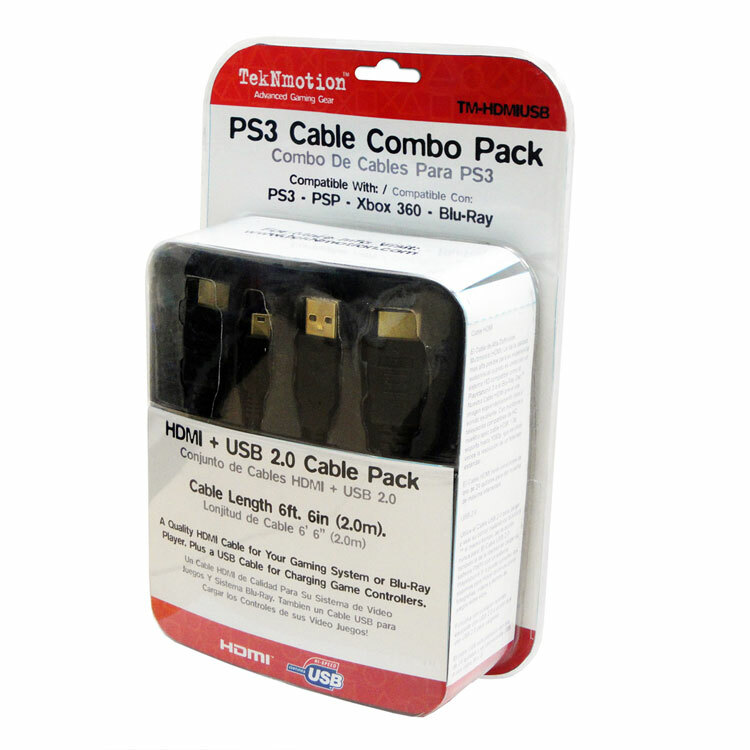 Now gamers can purchase an afford HDMI cable and USB combo for their PS3, XBox 360 or Blu-Ray player to connect to your high-def TV at the same high quality specs of cables costing more than twice as much. In addition, the USB cable included can be used for charging PS3 controllers or other rechargeable devices like digital cameras. Say NO! to the ridiculous prices the big names charge for their HDMI cables with no added benefit. Get a 2M gold plated HDMI and a USB cable for less than just one HDMI cable from the other guys.